Please see the new Tutorials! Supports Most DC resistivity arrays, including: Wenner, Schlumberger Dipole-dipole Pole-dipole and Pole-pole arrays. Supports Resistivity only or Resistivity with IP measurements in terms of PFE, Chargeability in msec or Phase in mrad. Supports Magnetotelluric (MT) sounding inversion with Apparent Resistivity and Impedance Phase. Supports Horizontal Coplanar, Vertical Coplanar and Vertical Coaxial Frequency-Domain Electromagnetic in-phase and quadrature measurements made versus frequency, coil spacing or instrument height. Measurements can be in percent or ppm of the primary field. Supports EM Conductivity measurements in terms of apparent conductivity in milliSiemens/m. Supports TEM measurements taken with central loop, fixed loop or coincident loop configurations (additional license fee required). 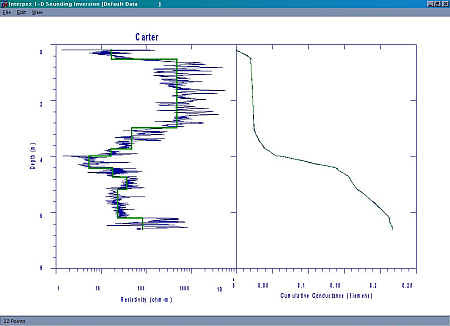 IX1D has the capability to read in a resistivity well log from a flat ASCII file and the user can interactively reduce the log to several discreet layers by fitting straight line segments to the cumulative conductance in the log. The resulting model can be copied to the model in the current data set for further modeling. Creation of data by spreadsheet entry or copy/paste from another spreadsheet. Import of data or models from flat ASCII files. Models are entered from the keyboard or copy/pasted from a spreadsheet as either Depth models or Layer Thickness. Parameters can be fixed so they are not varied during the inversion or limits can be applied so a parameter can only vary within a specific range. Layer boundary elevations are shown and calculated relative to surface elevations. The Model Entry dialog box allows for dynamic column and row manipulations to make model entry more convenient. Fix Flags allow the user to fix parameters for the inversion calculations. 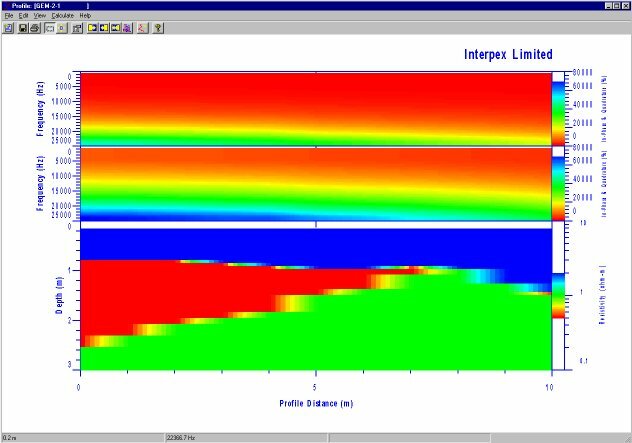 Either the layer thickness (or depth) and/or the resistivity can be fixed in the inversion process. Forward and inverse model calculations can be carried out using buttons on the model entry dialog. Models can be inverted using either the layer depth or layer thickness. Graphics are presented as the Sounding data on the left hand side with the model on the right hand side. Interactive property sheets allows for user configuration of displayed data. For DC and IP data, the model can be displayed on the same axes as the data. Menu commands and toolbar buttons are available for estimating a layered model (DC and IP data only), estimating a smooth model or analyzing equivalence of the layered model. Smooth models are generated by starting with as many layers as there are data points. 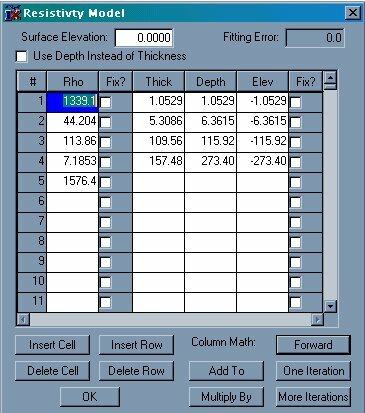 Thicknesses are automatically generated from the spacing or frequency data and the model begins with a homogeneous earth (all layers set to the average resistivity found in the data). Inversion can be Ridge Regression or Occam's inversion. The sounding window display can be set to show the layered model, smooth model, equivalence analysis or any combination of these three. 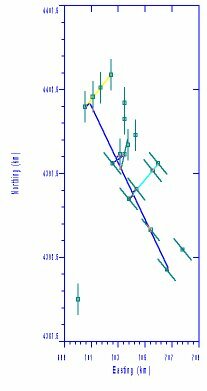 For DC resistivity (with IP), the model(s) can also be shown on the same graph as the data, in which case the spacing axis doubles as a depth axis. For MT data, the Bostick and Niblett inversions can also be shown. The model and data plots can be zoomed by dragging the mouse across the display with the left button depressed. This feature can be switched on and off by clicking on the Zoom menu command in the View menu or by clicking on the Zoom tool bar icon. 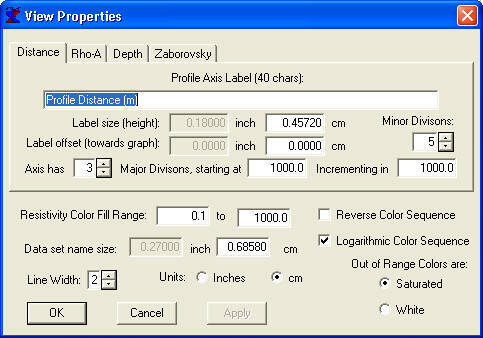 Axis labels as well as axis sizes can be edited under View Properties. Grid lines, including major and minor, for the Data and Model axes can be switched on and off under the View Grid menu subchoices. Axes can be auto-scaled from the model and data by selecting the View Unzoom menu command. Data, Layered models and Smooth models can be exported to ASCII files. Graphics can be exported as DXF, CGM or WMF file formats. Tool bar buttons are provided for the most-used menu commands, including New Sounding or Model, Open and Import data, Save, Print, Edit Data or Model, Zoom status, Unzoom, model display selection, Forward, Inverse and Equivalence Analysis calculations, and Estimation of Layered or Smooth models. 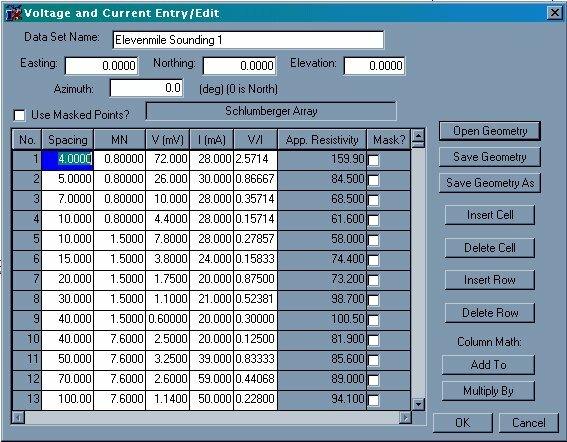 Many soundings can be included in a single data base file. Sounding types can even be mixed. Soundings are displayed on a map in the main window; geometry of the soundings is displayed as well. Display of Soundings taken in South Park, Colorado by K. Olofin. Note extension of electrode locations is indicated. Profiles were created from existing soundings. Profile data such as GEM-2, MaxMin and EM-31/34/38 can be imported from XYZ files. 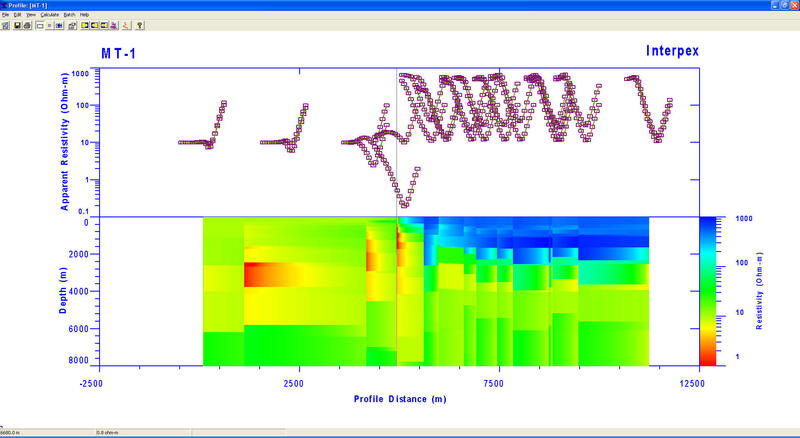 Profiles can be created from existing soundings and displayed as Zaborovsky plots, profile plots or pseudosections. Model sections along profiles can be displayed as Zaborovsky plots, profile plots or colored sections. Display of MT Data with apparent resistivity data displayed as curves on a Zaborovsky plot, synthetic displayed as lines and smooth model displayed as a colored section. Forward modeling, inverse modeling, smooth model estimation and equivalence analysis can be carried out individually or in batch or pseudo-batch mode. Profiles and soundings can be selected by name or by point and click at a map location. Soundings on a profile can be selected by point and click on a profile location. 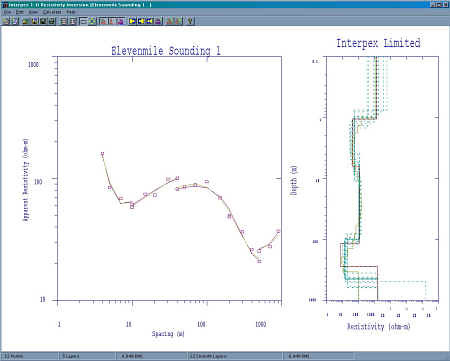 A model can be copied to the model clipboard and then back to an individual sounding, all soundings on a profile or to every sounding in the database. Models are entered from the keyboard as either Depth models or Layer Thickness or copy/paste from another spreadsheet. The Model Entry dialog box allows for dynamic column and row manipulations to make model entry more convenient. Fix Flags allow the user to fix parameters for the inversion calculations. Either the layer thickness (or depth) and/or the resistivity can be fixed in the inversion process. Graphics in the Sounding Window are presented as the Sounding data on the left hand side with the model on the right hand side. Interactive property sheets allows for user configuration of displayed data. For DC and IP data, the model can be displayed on the same axes as the data. Menu commands and toolbar buttons are available for estimating a layered model (DC and IP data only), estimating a smooth model or analyzing equivalence of the layered model. These appear on the sounding window and on the profile window. Using the command from the profile window executes a pseudo-batch operation where each sounding along the profile is processed in turn. View Properties are available for the sounding window, the profile window and the map window. Axes in the map window are never vertically exaggerated. 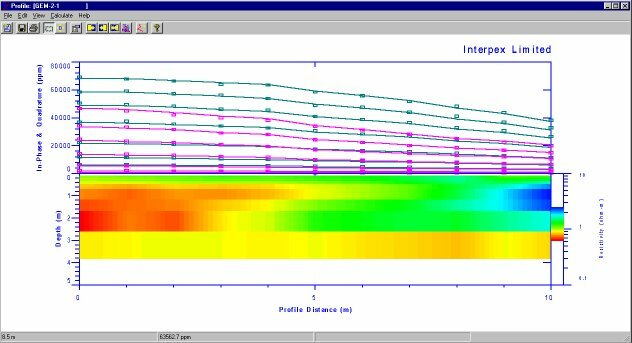 View Properties for the profile window allows for control of the resistivity color fill range and parameters. 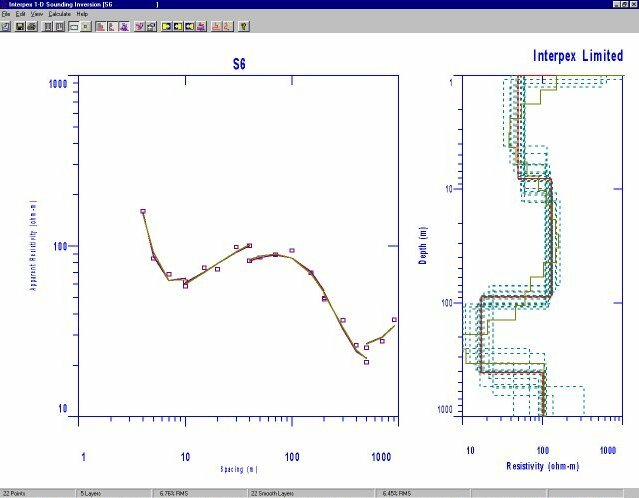 When smooth model estimation is started from the Profile window, smooth models are generated by starting with the same starting model for each sounding along the profile. The user selects the number of layers, the starting and ending depths and the starting resistivity. The model begins with a homogeneous earth (all layers set to the specified resistivity). Inversion can be Ridge Regression or Occam's inversion. The display in the sounding window can be set to show the layered model, smooth model, equivalence analysis or any combination of these three. 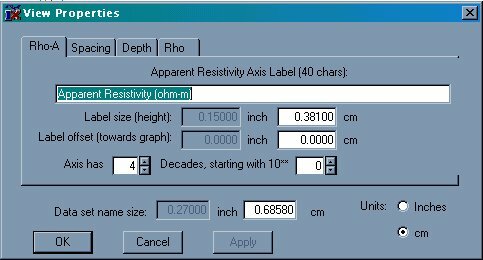 For DC Resistivity data, the model(s) can also be shown on the same graph as the data, in which case the spacing axis doubles as a depth axis. For colored section displays, the smooth model section is displayed if View/Smooth is selected; otherwise the layered model is displayed. GEM-2 data interpreted with 3 layers; layered resistivities are fixed and only thicknesses are allowed to vary. Soundings can be selected for display from the map window if no profile is displayed. Or they can be selected from the Profile Window. The Sounding Window looks much like the main window in IX1D v2. Sounding Display Window showing smooth model, layered model and equivalence analysis. IX1D version 3 is distributed as copy-protected software. The software can be downloaded and it works fully only with the demo data supplied. The license allows for a 30-day evaluation period. After the evaluation you are required to purchase the package in order to continue using it. Purchase price is US$999.00 for DC, IP, MT, Frequency EM and EM Conductivity capabilities. The price for for TEM is an US $3,499.00. Both licenses are offered with your choice of USB or Parallel key. Licensed users can obtain e-mail support by sending requests for assistance, bug fixes and feature enhancements to info@interpex.com Please include the serial number, version number and attach the files with which you are having problems to your e-mail request. The newest version can be downloaded from this website and will work with your licensed hardware key. Updates are free if you download them from our web site.